ALL UNITED IN THE STRUGGLE! . . . The censure motion has been rejected… One more time politicians have given the proof of their powerlessness. It’s therefore the working class, closely united with the students, that has to take responsibility for settling social problems. It could well be said to us that workers’ management or self-management are hollow catchphrases, the press happily declares that “Cohn-Bendit doesn’t know”; but we are convinced that the current situation demands a radical transformation of society. ALONG WITH THE STUDENTS the entire working class must create a united front and continue the protest… against the Police State and sclerosis of capitalist society. We must never cease to condemn all violations of the rights of workers, the omnipotence of corporations, the contradictions of capitalism and its powerlessness to meet the needs of the population. More than ever, we have to fight against easy solutions that involve pursuing dialogue with a State that doesn’t listen, and doesn’t hesitate to use violence and repression. The news reports give us motive, neither mini-strikes nor petitions to elected representatives have brought remedies to the people’s malaise. The C.N.T. Has been in solidarity with the students from the start. In direct action, in the unlimited general strike, in this popular desire, this passion to create a better society, more just and humane, WE REMAIN UNITED RIGHT TO THE END! 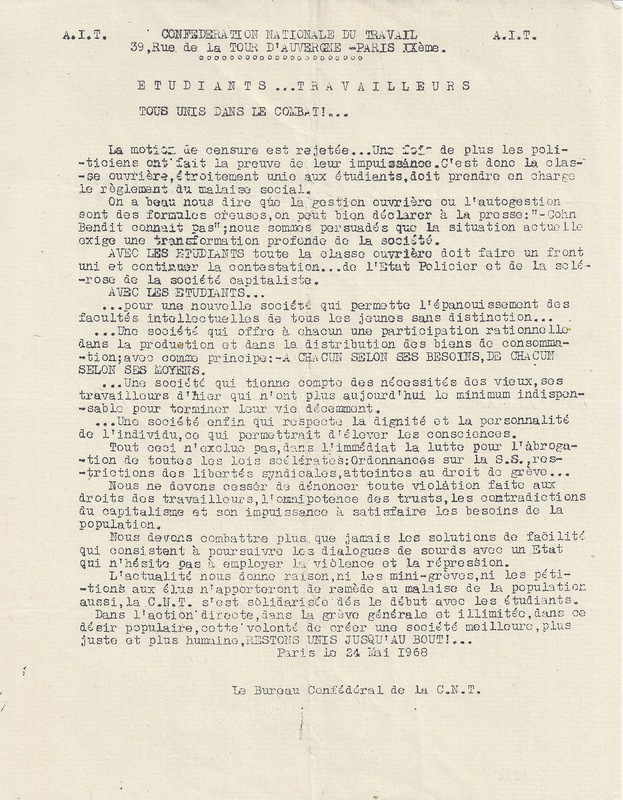 Confederated Committee of the C.N.T.